The Volvo World Match Play Golf Championship heads to Bulgaria! We are happy to report that the Volvo World Match Play Championship would be making the switch from Spain to Bulgaria for 2013 fulfilling this exciting golf destination's dream of hosting its very first European Tour event. Bulgaria offers an exquisite range of golf courses designed by some of the worlds top golf professionals and it is the Thracian Cliffs Golf & Beach Resort that has been chosen to host this historical event. Designed by the South African legend Gary Player the Thracian Cliffs set on the Black Sea Coast presents every golfer with a challenging and competitive course surrounded by breath taking scenery and spectacular views. Blending a perfect combination of local architecture with a natural sea front environment, the resort not only offers an incredible 18 hole round of golf but also an exceptional international level of services including the relaxing spa centre. 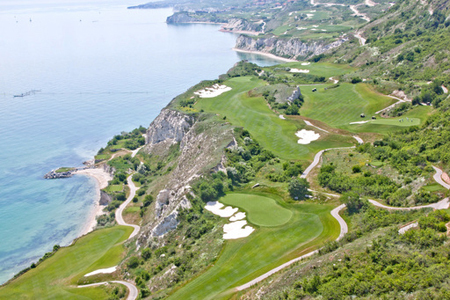 As the true specialists to Bulgaria, Balkan Holidays are delighted to offer clients packages to the Thracian Cliffs Golf & Beach Resort for summer 2013 with competitive prices and flights from over 8 UK airports. To find out more or to book visit www.balkanholidays.co.uk or call our friendly reservations team on 08451301114.